The boats are modern and comfortable, with a capacity of 200 or more passengers. The main hub of ferry service is the Hamilton ferry terminal located in Hamilton City and accessible from Front Street. This is from where all the ferry routes originate, connect to various places in the island and return. 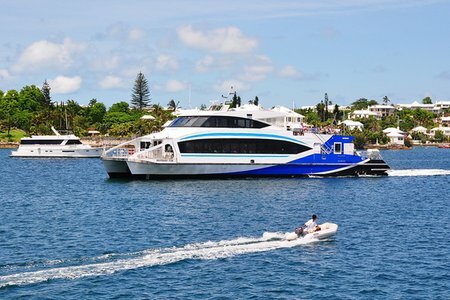 Although you may not be able to reach out to every corner of the island by ferry, it is a formidable part of Bermuda's Public Transport System. In many cases a ferry service would be much more convenient and faster than the bus or even taxis, and of course more scenic. So if you are planning to get around the island using public transports, you should first figure out if your destination is reachable by ferry. If so then try to avail the ferry service if the timings are suitable. All ferries (i.e. the catamarans) have a restroom/bathroom at one end of the inside deck. Other than toilet facilities, the restroom would have a small sink at one corner with a mirror, a hair dryer etc. A route does not necessarily connect just two points, and may go through several legs of journey connecting several points before returning to Hamilton. But all ferry routes do start from Hamilton ferry terminal and return there (with the exception of Orange route ferry which operates between Dockyard and St. George). The best way to understand the Bermuda public ferry routes is by first knowing the location of ferry docks in the island. Hamilton Ferry Terminal, which is the main hub of all ferry routes is located centrally and on Front Street. There is a ferry dock at the Royal Naval Dockyard which is located at the western tip of the island. The ferry dock at the dockyard is 5-minute walk from cruise berths and mostly used by cruise ship passengers docking at Kings Wharf or Heritage Wharf. There are few other ferry docks at the western side of the island. Watford Bridge and Cavello Bay docks are in Sandys Parish (in Somerset area) while Rockaway is in Southampton. These docks are used by both residents and tourists staying in those areas. There are several small ferry docks in Warwick and Paget across Hamilton Harbor such as Belmont Ferry, Darell's Wharf, Salt Kettle, Hodson's Ferry and Lower Ferry. They are all at short distances from Hamilton ferry and are catered by a common ferry route called the Pink route. This is a much shorter route compared to the others and therefore the fare along this route is also lower. The Pink route is mostly used by daily commuters. Ferry dock at the eastern end is located at St. George's Town. It's at a walking distance from Kings Square. NOTE: There is no ferry connection between Hamilton City and St. George. So bus is the only other public transport option between these two points which takes about 1 hour each way. There are four ferry lines or routes that connect various ferry docks in Bermuda. They are identified by their respective colors (Blue, Pink, Green and Orange). High-speed catamarans operate on the longer routes (i.e. Blue, Orange and Green routes). The catamarans can carry scooters, motor cycles, bicycles etc (but allowed only in designated routes) at an additional cost of $4. But if you have a transport pass, you can take your two wheeler for free. BLUE ROUTE: This is a direct ferry route operating between Hamilton and Dockyard and is lot faster than the bus or any other transport for travelling between these two points. It only takes 20 minutes of one way ferry ride between Dockyard and Hamilton compared to about an hour by bus and about 40 minutes by taxi. The service is reduced on Saturdays, Sundays and Public Holidays. Scooters and motor bikes can embark in Hamilton and Dockyard only at specific times (check schedule below). ORANGE ROUTE: This route operates between Dockyard and St. George along the northern shoreline. It takes 35 minutes each way. This ferry line operates during the summer season only (i.e. usually second week of April to first week of November). The service is only from Monday to Friday (no service on the weekends). It offers a great scenic cruise along the north-shore with magnificent views. Motor bikes and scooters are not allowed on this route. GREEN ROUTE: This route connects Hamilton with ferry docks of western parishes like Watford Bridge Ferry, Cavello Bay and Rockaway. Depending on time, the sequence of coverage changes. No service on Saturday & Sunday. Scooters and motor bikes can embark at Hamilton and Rockaway but not at Watford and Cavello Bay. PINK ROUTE: This is a short ferry service from Hamilton City to several small docks in Warwick and Paget parishes. The points covered in the route are Lower Ferry, Hodson's Ferry, Salt Kettle, Darrell's Wharf and Belmont Ferry Stop. The service is reduced on Saturdays, Sundays and Public Holidays. Scooters and motorbikes not allowed on this route. Bermuda Government publishes a Summer Schedule and a Winter Schedule every year for ferry services. The Summer Schedule remains in effect usually between mid-April to early November. The Winter Schedule applies to the remaining period of November to Mid April. Ferry routes and ferry timings go through some changes almost every year. The schedule is published few days before it takes effect. During summer, the ferry services on most routes are much more frequent compared to winter due to higher tourist demand. The service however gets reduced on Saturdays, Sundays and Public Holidays. The Orange Route between Dockyard and St George does not operate on Saturdays, Sundays and Public Holidays, as well as in the whole of winter because of low demand. Bike or Scooter not allowed on Watford Bridge and Cavello Bay. No service in winter. Service to resume in April. You can use tokens, tickets or Transport Pass, or pay cash (by exact change) in ferries. The pass is convenient and gives you unlimited hop on & off access to both buses and ferries. You can buy the passes or tokens at Hamilton ferry or bus terminals, designated Visitors Information Centers etc. Book of 15 tickets are available only in post offices and the main ferry and bus terminals in Hamilton. Check out Bermuda Passes, Tickets, Tokens and Fares to know about all the mode of payments, fares, places to get pass/token/tickets, and other useful information. While most ferries are wheelchair accessible (lower deck only), unfortunately not all ferry points or docks have proper ramps for wheelchairs. Ferry docks that are wheelchair accessible includes Hamilton, Dockyard (i.e. ferry dock for Kings Wharf), Rockaway in Southampton and only limited size wheelchairs at St. George. Located at the western end of Front Street next to HSBC Bank. Contact 441/295-4506 for further information on Bermuda ferry services. 1. What that schedule is for that night? 2. Is the fare different than other nights, of $4.50 per person, each way? 3. Should I purchase the tickets in advance? Thanks, so much! We are celebrating my in-law's 60th anniversary so I am trying to gather as much information ahead of time to make it easier for their mobility. Hi, the summer ferry schedule for 2019 is not yet published, so you can not get Harbor night ferry schedules until then. Fare remains the same as any other day. You can buy a token or pass while on the island or use cash to pay on the ferry. My wife and I are cruising to Bermuda next week. We plan to use the ferry once from the Dockyard to Hamilton. I've read that you must have exact change. Can I pay with a $5 bill or do I have to have $5 in coin? If so, can it be US quarters? US quarters are accepted. However ferries also accept $5 bill. The date today is Sept. 8th, 2018. And they still have not published the new winter ferry schedule which begins October 29th! We are coming on the Carnival Ecstasy scheduled to arrive in Bermuda at 5 PM at Kings Wharf on November 5th! So if you follow last winters schedule, the last ferry to Hamilton will have already left at 4:30 PM! So a ship with over 3,000 passengers will have no recourse but to use either the Buses, or very expensive Taxi's to get around anywhere! But we still do not know for sure what the schedule actually is! And to have the last ferry leave at 4:30??? I think it is time to get into the 21st Century Bermuda! Plus, if you use a wheel chair or a mobility scooter, the ferry is the only way you can get to and from Hamilton reliably! Unlike the UK, Bermuda is not handicap friendly! NOT AT ALL! The information here says the orange ferry route runs until October 29. In another line it says probably until the first Week of November. Which is correct. Does it stop on October 29th which is the summer schedule or does it actually run until the first week of November. Please follow the dates as mentioned in the schedule. The other line says 'usually' and not 'probably', and that is to get an idea how it has usually worked historically and can be used as a broad guideline when the schedule is yet to be published. 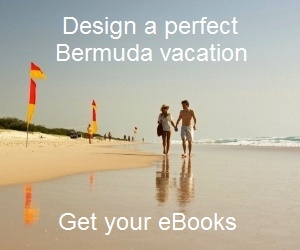 Hi, I am cruising to Bermuda and renting a boat in Hamilton. I need to take the ferry over. My question is; does the ferry follow a prompt schedule, or do we need to allow some extra time? Thank you! Hi, usually the ferries are on schedule unless there is a long queue of passengers delaying the boarding. Hi Raj, We have a party of four that are arriving on a Monday in July, and since the cruise ship will port at 1pm, the first ferry for Hamilton leaves at 2:15 or 14:15, then the next ferry at 15:45. Do the ferries sell out of tickets when cruise ships port. Is it best to reserve or buy tickets before arrival to guarantee a spot aboard for one of these ferry times? Are there other ferry operators. Thanks! Hi, all ferries in Bermuda are operated by 'Sea Express' which is part of Bermuda Marine and Ports Department. You can not buy ferry tickets/passes in advance unless your cruise ship pre-stocks. Once you purchase tickets / tokens / or pass at the cruise port (payment can also be made to the ferry staff by cash in exact change), you need to queue up at the ferry dock and wait for the ferry to arrive. Usually the ferry can accommodate all who are on the queue. My husband is disabled and uses a power scooter. Is it possible to travel on the Orange ferry line from the Dockyards to St George? If it is not possible to disembark with power scooter, can we remain onboard and return (as we would be taking the ferry trip to enjoy the scenery). Many thanks. Hello, normal scooter is not allowed on Orange Ferry. So it' quite unlikely that they will let you board with a power scooter. You need to check with the crew at the ferry dock and try your luck. We got in line for the 5:15 ferry at the dockyard and didn't depart until almost 6 pm. Then the man? loading the boat? Left all the people who got on first take seats in the back and we were forced to go all the way to the front of the ship. We showed up for the 7:30 ferry about 2 minutes late and it was gone? Couldn't even see it anymore. Now there is a ferry sitting in front of us with the motor running (it's 7:55) and he said he can't leave until 9 pm. Also, I tried to buy a 15 ticket booklet at the dockyard and was told I needed to go into Hamilton to purchase those. Those rides would have been $2.50 each way so I got screwed out of $30! I guess if you're on a cruise your ferry service figured we can afford it. I've heard horrible things about the recent ferry service. We were here 5 years ago and the service was excellent and the people polite. I guess not anymore. Won't do that again! Since there are vans, taxis and minivans we'll use one of those services instead. The man at the ferry suggested if we were unhappy we should go to the website and complain. So here you go! Hi Raj, When will the 2018 Schedule be out? We arrive at King's Wharf on April 19,2018. Looking at the 2017 Schedule, it appears that the ferries might still be on Winter Schedule when we arrive in 2018? Thanks. Hi Doug, the winter ferry schedule is effective from October 30, 2017. One gets to know about the end date of winter schedule once the summer schedule is published. A schedule gets published only few days before it takes effect. So you won't know the span of winter schedule until summer schedule is published in April 2018. There are good chances that ferries will be on winter schedule when you visit. The people running the ferry from the dockyard to Hamilton and back & those at the ferry terminal were WONDERFUL in helping our daughter who is in a wheelchair. Hi Raj: We would like to take the ferry from St George to Dockyard on our arrival from Canada. Is it possible to buy a seat for the luggage if no storage space is available ? We are staying in Somerset and would prefer to travel by ferry rather than cab. We will of course be using taxis from the airport to St Georges and then from Dock yard to the house. Hi, unlike in buses, there is as such no restriction of carrying luggage in ferries. However note that Orange ferry has restricted operations and therefore you need to time it right. Hi, your plans are correct. Cash fare for each ride is $5 per person. Limited size wheelchairs are okay for St. George. A transport chair should be okay ... just talk to the crew before you board. Just wondering if the orange route ferry traveling between the Dockyard and St. George has restroom facilities. Yes, ferries have toilets/restrooms. The restroom also has a small sink at one corner, a small mirror, hand dryer etc. We will be arriving on the Celebrity Summit and want to go to the Festival on wednesday June 1st. Can you tell me how we can pick up the Ferry, the cost (we are senior citizens) and the time the Ferry runs. Any info you can give us would be greatly appreciated. Thank you in advance. Ferry dock is only 4-5 minutes walk from the cruise pier. There is a direct ferry to Hamilton. You can buy a day pass from the visitors information center ($19) located near the cruise pier or pay by cash ($5 one way). On Wednesdays, ferry timings are extended until 10:30pm (from Hamilton). I just read that the Visitor Information Center at the Dockyard will no longer sell tokens or multi-day passes. Can we use cash to take the ferry to Hamilton and then buy tickets there? We will be there in two weeks and then again on May 4th for three days on Celebrity Summit. I appreciate any guidance you can give. Hi, yes you can pay cash in ferry (in exact change in coins), go down to Hamilton and buy tickets. It says No Scooters or Mopeds; But Can Pedal Bikes be carried on the boats on the Orange Route? Pedal bikes are also not permitted in Orange route. Since the ferries only hold around 200 people do you have more than one ferry going to Hamilton at each departure time? With alimitation of 200 passengers, you may not get on and would have to wait a full hour for another ferry?? There is only one ferry per departure time. Raj, do the ferries have a orange, blue, pink banner to designate where they are going or are they clearly marked with destinations i.e St Georges, thanks. The new fast ferries do not have boards in front or on the sides displaying destinations, however they would have their main origin (like 'Hamilton') printed at the backside below their names, for example 'Resolute, Hamilton' or 'Serenity, Hamilton'. But you can't see that when you board a ferry at the dock. The older ferries in early 2000s used to have small boards on the sides showing the destination (like Dockyard, Somerset). The colors of the ferries also do not signify anything. You will know the ferry route & destination by the timings and of course there will be staff at the ferry docks to guide you. You won't go wrong. Hi, There is enough parking for both cars and scooters at the end of Tribe Road 5 and just outside Rockaway Ferry. At Belmont Ferry, there is also a small parking area on the other side of Harbour road. But that's actually meant for Belmont Hills Golf Club and Blu Bar & Grill guests. But nobody will drive you out if you park your scooter there. You can then cross over the harbor road and a stairway leads down to the small Belmont ferry dock below. I read on another site that Tickets for 3 and 14 Zones sold in Booklets of 15 are honored on buses only. Is this true? We can't use these tickets on ferries? Thanks. If you go through the official ferry schedule, under 'Fare Information' you can see that ticket fares are also mentioned for ferries along with passes and tokens. So tickets are accepted in ferries as well. 14-zone tickets are applicable for all but Pink route and 3-zone ticket for Pink route. Is there a ferry stop at/near the Somerset Bridge? I have seen designation on several maps and then not on others. I am wondering if some of the maps I am looking at are outdated. If there is still a ferry that services Somerset Bridge what is the routing, please. Does it go to Dockyard or to Hamilton? I will be in Bermuda May 16-20. Thank you! Hi, Ferry dock nearest to Somerset Bridge is Cavello Bay (in Somerset area, Sandys). The ferry goes to Hamilton via Watford Bridge ferry dock or Rockway depending on time. My family, along with my parents, will be traveling to your beautiful island in May via the Celebrity Summit. My question is, my parents are in their late seventies/early eighties: 1) how far of a walk is the ferry dock from the Summit, 2) the ferry dock to the center of Hamilton, and 3) the ferry dock to the center of St. George? Also, is an Orange Schedule going to be available soon? Lastly, if we plan on two days of ferry riding--one day to St. George and the other to Hamilton--we should buy a 15 ride 14 zone booklet, is that correct? Thank you so much for your insight, I really do appreciate it! Hi, Ferry dock at the dockyard is only 4-5 minutes walk from the cruise pier. Ferry to Hamilton takes 20 minutes and St George 35 minutes. Orange ferry schedule should get published soon, certainly well within April. Yes you will need 14-zone tickets for both rides, so buy a booklet of 15 tickets of 14-zone rides. Note that one ticket can be used for a one-way ride only. So calculate the total number of tickets you require for your group and accordingly buy the booklets. Hi Raj, Thank you so much for the info. Would you please let me know the walking distance once we get off the ferry in both Hamilton and St. George to where the main action/sites are. This information would be greatly appreciated. Thank you so much and we look forward to our visit! In Hamilton, the Ferry Terminal is on Front Street which is the heart of the city. As you come out of the ferry dock, you will be right where all actions are... just cross over to the other side of street and walk along ... lot's of shops, restaurants and bars. In St. George as well, come out of the ferry dock, walk over the short bridge and you are right at Kings Square which is the town square of St. George. Need to know if the schedule for the Orange ferry route is published yet. We arrive by cruise ship on April 24th and your schedule states that the new route times will be published in April. Can you help. Hi, 2015 summer ferry schedule has not been published yet. It's likely to be published only in April. And this is the problem with Bermuda's Marine & Ports Department. They fail to understand that unless they publish the schedule well in advance, tourists can't plan their vacation. Just to give you some ideas on the Orange ferry based on schedules of previous years, the ferry runs on Monday-Friday. It makes 3 or 4 round trips from Dockyard to St George depending on the day of the week. Last year it started operating from April 28th. So unless they start earlier this year, you can not perhaps plan on it. In that case, take the blue ferry to Hamilton (20 minutes) an then a bus (#10 or 11, 50 minutes) to St George. In case you are able to get the orange ferry, here are the timings of last year: Mon/Wed/Thu: Leaves dockyard at 9:30/11:30/2:00/4:30; Returns 10:30/1:00/3:30/5:30; Tue/Fri: 9:15/11:15/1:15; Returns 10:15/12:15/2:15. The orange ferry timings remained more or less the same over the past few years. My mom and I dock on RC Grandeur Of The Seas at Dock Yard 3pm (November 4). We would like to Ferry to St George early next morning, but I see no schedules as of yet. Do you know when they might be posted. Also, it looks like the cost to take a scooter on certain ferries is about $4.00 one way, plus the per person charge. Is that accurate? Thank you. Hi, Winter ferry schedule (starting November 4, 2013) is likely to be posted by October week 4. But note that Orange Route Ferry between Dockyard and St George does not usually ply in winter and you won't get one after November 3rd. If you buy a transport pass, then there is no extra charge to take a scooter on ferry, otherwise you pay an additional cost of $4 one way. Love your website. My husband and I will be coming in on the Breakaway on October 2 and are wondering if there is any ferry service from the dockyard to Waterford Bridge as we are renting pedal bikes and would like a safe way to get to the start of the railway in Somerset. Many thanks. Hi, There is no direct ferry between Dockyard and Watford Bridge. There is no problem as such biking up to the railway trail point from dockyard. Just keep to left. This year (2013) the summer ferry schedule started effective April 15th, last year from April 16. So likely it'll be on winter schedule when you arrive. We will be in Bermuda on June 29, 2013 aboard the Explorer of the Seas. Will there be ferry service to St George? When we were there several years ago the printed ferry schedule did not show service on the weekends, however, we were pleasantly surprised to find ferries running for the cruise ships. Yes there will be ferry service to St George (Orange Route) but only 3-4 round trips a day and no scheduled service on week ends. Hi, Summer ferry schedule starts from 8th April in 2013. So it'll be summer schedule for you which is not yet published. You can't purchase the passes online. They are sold only in Bermuda. Is the ferry wheelchair accessible? Is there a restroom aboard? Hi Mary, Ferries operate all through the week but less frequently on the week ends. However they ply for certain hours between morning to evening. The current summer ferry schedule is valid from April 16 to November 4, after which the winter schedule starts and the ferries become far less frequent. Presently the last ferry from Hamilton to dockyard is at 8:30pm, and the last one from dockyard to Hamilton is at 9pm. Update April 2013: The recent summer ferry schedule has last ferry from Hamilton to dockyard at 9:30pm (Blue Route) and starts back from dockyard at 10pm during the week days. On Saturday, Sundays and public holidays, operation ceases much earlier. Hi Jim, The Ferry (Orange Route) that connects Dockyard (Kings Wharf) with St. George operates from Monday to Friday. So on a weekend, your best option is to take a ferry to Hamilton City (Blue Route which takes 20 minutes) and then take a bus (#1, 3, 10 or 11, about 1 hour). Note: bus routes #10, 11 to St. George are shorter. Also note that the ferry services on weekends are limited. The last ferry from Hamilton for dockyard leaves at 6pm on Sunday. So check out the timings at a ferry stop before planning your day.